Here’s Ed and I walking out of the theater after seeing Robin Hood. Ed: Well . . . I have one good thing to say about it. Me (brightly): Oh, yeah? What’s that? Ed: It employed 855 people. Lately, Ed has been counting the names in the credits at the end of movies. Maybe because I make him sit through them. If I remember right, Imaginarium of Doctor Parnassus was 700, Alice was around 800 and Avatar was a whopping 1400 and something. So that’s where Robin Hood stands on that score. I guess Ed didn’t like the movie much. My feelings weren’t quite so extreme. It had some great actors – Cate Blanchett, Eileen Atkins, Max Von Sydow, William Hurt (nice to see him on the screen again) and a personal heart throb of mine – Matthew Macfadyen (although under-utilized in this film). Russell Crowe, at this point, is a given in Ridley Scott films so no surprises there. I also enjoyed seeing yet another interpretation of life in medieval times. All earthy and ragged with the barest touches of color and class. These characters had less greasy hair than some medieval envisionings, but more body odor. I particularly liked the way the “epic” battle scenes were at the same time kinda small. The castles were very compact. The armies were a manageable horde. The roads through the dark woods were rather narrow. Reminding us that we took up a lot less space on this planet, once upon a time. I certainly acknowledge, however, that the script fell short of its mark, so to speak. I had already gleaned as much from the lackluster reviews, much to my disappointment. So, by the time I got to see it, my intent was not so much to have a surpassing experience as it was to discern what it’s mistakes might have been. One of Ridley Scott’s hallmarks as a director is the thinking person’s action film, Thelma & Louise and Black Hawk Down being two good examples. But those were both explicitly topical, meaning that the action was there to serve the intellectual query. Are women justified in responding to male aggression with aggression of their own? Should America intervene in internecine foreign conflicts for humanitarian goals? The greater challenge is to make a thinking person’s action film that is conceived as pure entertainment. This is the apotheosis that Scott was able to reach with Gladiator. However, in doing so, he set the bar very high for himself. He made a film that was high-octane spectacle while also working in aesthetic layering, human resonance and greater meaning than all the slash and burn. Sadly, he did not meet his own standard with Robin Hood. I think this is at the core of all the collective moaning about this film. So what exactly was missing? The answer, in a word, is theme, an essential ingredient in any thinking person’s film and the level on which Robin Hood misfired badly. This is particularly unfortunate since the Robin Hood legend is nothing if not thematic, operating, as it does, from the premise that it is justifiable to steal from the over-fed rich if you are doing so to serve the starving poor. But, in my observation, theme is not something you want to have just statically sitting on top of your story. You don’t want to just take it as a given that Robin Hood is the guy who stole from the rich to give to the poor. This is, in fact, a limitation of the Robin Hood story, as it has always been told. It becomes monotonous. How many times can you watch the Merry Men carry out their escapades before it just becomes the same old story over and over again. It becomes like a perpetually-happy-ending television show. Theme is best utilized when it is made active, which is to say when it has a progression from beginning to end. 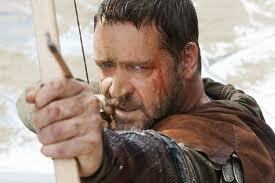 So Ridley Scott’s instincts were correct to start with Robin Hood’s beginnings. Then you have someplace to go. The overriding question becomes, How did he get to the particular moral stance that made him Robin Hood? Most of us will do what’s right when confronted with an injustice suffered by one who matters to us, and we are the only one who can help, and we have the means with which to do so. But taking a stand when we don’t have to? When no one’s looking? For a complete stranger? Just for the hell of it? No thanks. Think I’ll just stay here in my comfy little life. So why does this Robin Hood guy do all that running around helping people in need just for the hell of it? There’s a question to explore! And what are we given in this film as an answer for it? First, we see Robin Longstride being asked by King Richard if God would have approved of the Crusades. Robin says no, and describes a moment when an old Muslim woman, about to be slaughtered, looked on him with pity because she knew they had become godless. The King responds by calling him honest, brave and naïve. Oops, now we have a problem. The man is highly principled at the outset. And aware of his principles and willing to take a stand against the King for them. Where are we going to go from here? It’s that self-awareness thing again. Too much, too soon. I would have rather he started out all wrapped up in his comfy little self-protective values. Then I might have been genuinely surprised to see him gradually metamorphose into someone who goes out on a limb for others. And I might have even been inspired by it. This is the other problem with Scott’s Robin Hood: In a word, character. We don’t see any character progression in the course of the story. One measure of this is, as already noted, he is as earnest and principled in the beginning as he is at the end. Another measure is that all of the gains he does achieve are external – bringing the barons and king together to defeat the French, saving the village from the plunderers, winning the affection of Marian and creating his outlaw do-good community. So we have accomplished much in the area of plot and action. But we haven’t gone anywhere with either theme or character. Remember back in college English class reading Shakespeare’s Henry the Fourth, Parts I and II? . . . No? . . . Me neither. I read them much later. Anyhow, perhaps you’ve heard of the scallywag Prince Hal and his sidekick Falstaff who spend almost the entire first play getting into trouble in brothels and taverns while Hal’s earnest, kingly father is out tending to the very serious business of defending the realm. At the end of the first play, young Hal finally proves himself in battle and is reconciled with his father. Then, in the second play, Hal distances himself from the profligate Falstaff and begins assuming the responsibilities of being a king. And in the third play (Henry V), he proves to be a very effective king, something few would have predicted in his youth. I could see creating a Robin Hood who is merely irresponsible and roguish to start. Then, when external circumstances bear down upon him, such as being wronged by Prince John and such, he becomes outwardly angry and dour. This is compounded when he begins to get weighed down by the injustices in the world. He feels powerless, and becomes bitter and resentful. Then he has his first opportunity to steal from the rich (such as reclaiming the seed corn from the church) and he has fun for the first time in months (or years). This is the beginning of his new career path. And we have a merrier Robin than Russell Crowe was able to give us. This is the big advantage of working off the Robin Hood legend – no one knows who he really was or where he came from. So why not pose a “what if?” that gives him plenty of reason to have a chip on his shoulder? Some people are born to be leaders, most people are not. So in Robin we have a born leader who, if born legitimately, would have been a perfect heir to the throne. Meanwhile, Richard has no legitimate heir, so the fate of the people falls into the hands of that miscreant Prince John. See how this makes the conflict with Prince John personal? That lends considerable help to the external conflict, as well as being grounded in Robin’s internal life. But I’m just playing around here. Monday morning quarter backing, as it were. I don’t presume to know what actually would have saved this film.